Jeff Golub (April 15, 1955 – January 1, 2015) was an American jazz guitarist who had a solo career and who led the band Avenue Blue. He worked as a sideman for a number of rock and pop musicians. He was arguably best known for his work with Rod Stewart, with whom he played from 1988 until 1995. Golub was born in Copley Township, Ohio, near Akron. He grew up listening to pop music, rock, blues, funk, and R&B. In the 1970s he attended the Berklee College of Music in Boston. In 1980 he moved to New York City and worked for rock guitarist Billy Squier. During the 1980s and '90s, he worked as a sideman for Ashford & Simpson, Tina Turner, John Waite, Dar Williams, Vanessa Williams, and Peter Wolf. From 1988–1995, he recorded and toured with Rod Stewart. He was a member of Dave Koz and the Kozmos, the house band of The Emeril Lagasse Show. In 1988, Golub released his first solo album, Unspoken Words. In 1994, he formed the band Avenue Blue and released the band's first album. For the album Out of the Blue (Atlantic, 1999), he dropped the Avenue Blue prefix and recorded simply as Jeff Golub. He recorded a blues album with Billy Squier, Peter Wolf, and John Waite, and an album with blind jazz pianist Henry Butler in 2011. In 2011, Golub started to lose his eyesight due to a collapsed optic nerve. In September 2012, he fell on the tracks of a subway but was saved by people nearby. He was taken to the hospital with minor injuries. Soon after, he released the album The Train Keeps A-Rollin' with keyboardist Brian Auger. In 2014, he was diagnosed with a rare brain disease, progressive supranuclear palsy, and in 2015 he died from the disease at the age of 59. ^ Heaton, Michael (8 January 2015). "Renowned Ohio-born guitarist Jeff Golub dies at age 59; an old friend remembers him fondly". Cleveland.com. Retrieved 16 September 2017. ^ a b c d e Henderson, Alex. "Jeff Golub". AllMusic. Retrieved 16 September 2017. ^ "Dave Koz & The Kozmos" (PDF). Ionpress.com. Retrieved May 10, 2010. ^ Cline, Suzy. "Jeff Golub Website - Biography". Jeff Golub. Retrieved 16 September 2017. ^ a b Tamarkin, Jeff (1 January 2015). "Guitarist Jeff Golub Dies at 59". JazzTimes. Retrieved 16 September 2017. ^ Sandoval, Edgar; Jacobs, Shayna (5 September 2012). "Straphangers save blind musician". NY Daily News. Retrieved 16 September 2017. ^ Keepnews, Peter (10 January 2015). "Jeff Golub, a Guitarist at Home in Several Genres, Dies at 59". The New York Times. Retrieved 16 September 2017. 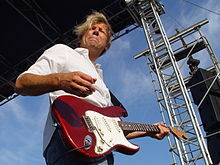 Wikimedia Commons has media related to Jeff Golub. This page was last edited on 2 April 2019, at 20:35 (UTC).